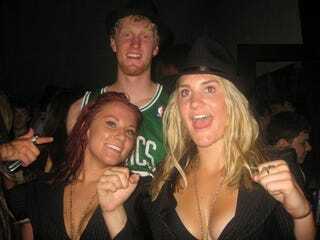 I'm not sure if this picture is from Halloween or if Arizona sophomore Chase Budinger is just a big fan of Larry Bird, but that hardly matters. Who wouldn't want to be a basketball player at the U of A (One lucky soul even got the privilege of being my neighbor for a couple of seasons)? You're always welcome at the NCAA tournament, the campus is beautiful, and the women are both plentiful and pliable. I think it's safe to assume that this has nothing to do with Lute Olson's departure.